Near Vision CK ( Conductive Keratoplasty) is a vision correction procedure designed correct farsightedness, and near-vision problems that come with age. Near Vision CK reduces the need for reading glasses and gives you increased near vision. CK is a non-invasive procedure that uses warm radio waves to shrink the soft collagen tissue within the cornea to correct farsightedness. The CK procedure requires no cutting or blades. Instead radio waves are applied at equal intervals shrinking the collagen around the cornea. This shrinkage causes the area to contract giving the cornea a steeper shape. Patients generally see results from the procedure immediately, and over the next few weeks vision may also improve as the eye fully react to the procedure. CK is an extremely safe procedure, it is the only procedure FDA approved to treat presbyopia in the aging of the eye where near vision becomes difficult to focus, and side effects are very minimal. CK is performed onsite in our state-of-the-art surgical suite and the procedure takes approximately 5 minutes. 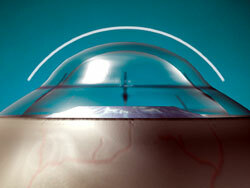 CK is one of the many vision correction procedures Dr. G.N.Qureshi offers. During your initial consultation Dr. G.N.Qureshi will discuss each and every treatment option with you to determine which procedure can provide the best results.